Unless you happen to work for the search giant that created it, Google+ is probably not your social network of choice. Nevertheless, there's a ton of functionality hidden behind its walls, covering everything from photos to local searches as the influence of Google+ stretches across the company's multitude of other products. Here's how to get the most out of it. We've pulled together 10 of our favorite tips and tricks from the social network that should help you get more out of Google+, or tempt you back to give it another go. We're going to assume you know the basics of Google+—circles, sharing, Hangouts and so on—and focus on some of the features you might not have come across or that have only recently gone live. In the event you don't have many active friends on Google+, you can fill up your stream with hot topics and trending stories from other users. Open the "Explore" tab to see popular posts from across the network, tailored to your interests, then use the slider on the right to control how many of these stories appear in your normal news stream. Google+'s groups are called communities, and they're very flexible. You can find huge groups in support of Game of Thrones and cat pictures, or create your own private groups for work colleagues or to plan a holiday trip with friends. If you do put together a community of your own, you can share updates and photos straight to it instead of one of your circles. What's more, your community can have multiple categories for its posts, making it easier to keep track of discussions and shared content. You can also quickly launch events that are restricted to community members. Circles don't have to have real people inside them. Create an empty circle called "Posts of note" (or something similar) from the Find people tab, then share everything you find interesting to this circle. You can bring up posts from the circle at any time by choosing it from the top of your stream, and share its unique URL with others if you want to. You may or may not find the circles system helpful for sorting your friends and contacts on Google+, but you can add these lists to Gmail too — it gives you another way of organizing your emails and chats on top of the labels built into Gmail itself. Visit the Labels tab of the Gmail Settings page to show or hide your circles, which can also be used in searches and filters via the "circle:" operator if you need them. 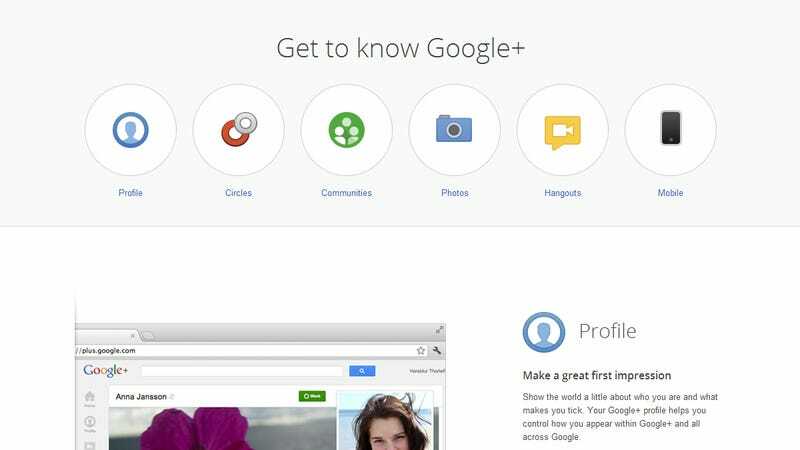 Google+ offers up plenty of controls for managing who can see what on your profile. Use the "View profile as" drop-down on your page to see how it looks to the world at large, or enter the name of one of your friends. Under each of the sections on your About page you can click "Edit" to change the audience for your work history, bio, friends and so on, and of course you can limit each of your posts to particular circles every time you share something new. Pay particularly attention to the privacy of personal information (such as your Google Latitude check-ins) that you might not want publicly visible on the Internet. If you produce anything on the Web, whether it's a local Blogger site or a guest post on Gizmodo, you can associate the link with your Google+ profile. There are some hoops you'll need to jump through first — it's easier if you have an email address associated with the domain you're trying to link to — but you can find full instructions here. You'll need to add the site in question to the "Contributor to" section of your profile. Google+'s slow takeover of Picasa Web Albums is something of a mess at the moment, but while you wait for Google to untangle the crossover you can automatically upload all of your mobile snaps to a private album on Google+ for safe keeping. You'll need to install the G+ app for Android or iOS, then use the settings page to activate instant uploads — your pictures will be shrunk to a maximum of 2,048 pixels wide, and you can store an unlimited number of photos. Android users have the option to store images at their original size, in which case the space will be taken out of your Google Drive allocation. Google+ includes Twitter-style hashtags, Facebook-style mentions, and text formatting controls that you won't find on either of the more well-known social networks. Create hashtags in the usual way, preceding your tag with "#" or clicking on a hashtag to find matching posts. To mention someone or something, preface it with "+" and start typing until the correct name appears. And to format text, use *asterisks for bold*, _underscore for italics_, and -hyphens for strikethrough-. If you haven't installed the Google+ Android app, you might not know there's a bonus you don't get from the desktop site or the iOS app (for the time being at least) — the ability to publish mood emoticons alongside your updates. With Google+'s emphasis on visuals and graphics, they can add some substance to text updates that would otherwise get lost in the stream.